Pythonect supports standard control flow tools, but with a twist! There’s no if keyword in Pythonect, instead, boolean values are used to determine whether to terminate or continue the flow. Will print "Hello, world" because startswith method returned True (i.e. 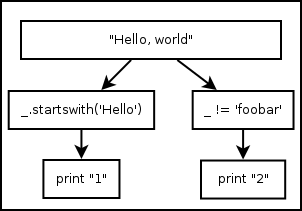 “Hello, world” string starts with “Hello” string). This will not print anything and return False. Both versions will print (each in its own thread, and not necessarily in that order): 1 and 2. Will print 1, 2, and 3 (not necessarily in that order). The same applies to generator functions (i.e. yield) and Python classes that implement __iter__() method. The code above will print the letters: a, b, and c (not necessarily in that order).